Is there anything that goes better leading up to Halloween then zombies? Damn right there isn’t, which is why Biff Bam Pop is happy to have scored an interview with Glenn Kay, the author of the recently released Zombie Movies – The Ultimate Guide. Kay covers the history of the genre, beginning with 1932’s White Zombie (yes, Rob Zombie didn’t come up with that one on his own), all the way up until 2008’s Diary Of The Dead. Along the way, Kay gives his recommendations, talks to some icons of the undead, and compiles a list of the 25 Greatest Zombie Films Ever Made. It’s a great book for both longtime zombie fanatics and newcomers alike. Prior to making appearances this week at Toronto’s World’s Biggest Bookstore (this Thursday at 7pm), the Borders across from the Walden Galleria in Buffalo (this Saturday at 2pm) and at the Chapters in Ancaster (noon on Sunday), Glenn Kay took the time to answer questions via email about Zombie Movies – The Ultimate Guide, the zombie film genre, and his experiences as one of the undead in George Romero’s 2005 film, Land Of The Dead. Andy B: Why the fascination with zombie films? Glenn Kay: I’m a fan of movies in general, but I became a big follower of horror movies when I was young because of a zombie. It was the mid 80s, my parents had just gotten a Betamax player. I saw George A. Romero’s Creepshow as a rental and loved it. I think its comic-book, exaggerated look appealed to me (I was reading comics a lot at the time) and I was fascinated by the Nathan Grantham zombie. I wondered how the filmmakers did it. As I got older, a friend in university told me that I needed to see Dawn of the Dead. It was funny, scary and had a lot of subtext. It was a very smart movie. I was immediately hooked on zombies and I’ve been looking for more films like Dawn ever since. Andy B: Where did the idea to write Zombie Movies – The Ultimate Guide come from? Glenn Kay: I had finished co-writing a very satirical book called Disaster Movies: A Loud, Long, Explosive, Star-Studded Guide to Avalanches, Earthquakes, Floods, Meteors, Sinking Ships, Twisters, Viruses, Killer Bees, Nuclear Fallout and Alien Attacks in the Cinema (it is only available in the US) that examined flicks like Titanic, The Poseidon Adventure and The Towering Inferno, and was speaking with my publisher. They always want to know what you’re working on next, so that they can build an audience for your titles. This conversation was immediately after my stint as an extra in Land of the Dead and I spoke about the occurrence. It seemed of interest to everyone I mentioned it to. In reality, I had done it just out of wanting to be a zombie in a George Romero movie. But having the experience as a zombie, my reviewing experience, along with a few connections I had to persons within the industry seemed to give me a unique perspective. I didn’t need much more convincing to jump right into it. Andy B: Zombie Movies reviews upwards of 300 films in the genre; as much as you love zombies, did you have difficulties sitting through some of the lesser films you watched? Glenn Kay: It was a long process. I sat through every film in the book that has a rating and most of the movies several times. I certainly have my favorites and there were films that were agonizing to sit through. What helped encourage me most was that every once in a while, I’d find something that I knew nothing about that completely surprised me. So I suppose what kept me watching was the hope that another film from nowhere would impress me. As soon as I turned in the manuscript, I certainly felt some burn-out and took a break from zombies. But already, in the last few months, several new movies have been released, so I’m slowly starting to watch them again. This time around, I’m taking notes, so that if the book does well enough and is updated, it should be a much easier process. Andy B: On the same note, did you come across any films you hadn’t seen that really impressed you? Glenn Kay: The Walking Dead (1936) from director Michael Curtiz (Casablanca) is a beautifully shot gangster/zombie film that ranks up with many of the classics of the era. I can’t believe it hasn’t gotten a proper release on DVD yet. 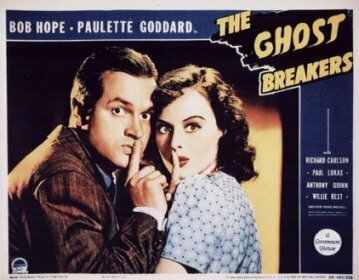 The Ghost Breakers (1940) was interesting for me because I hadn’t really seen Bob Hope at the height of his comedic talents. He really was funny back in the day! I hadn’t caught all of the 50’s movies out there and titles like Creature with the Atom Brain (1954) were a lot of fun. I enjoyed the completely bizarre and whacked out British biker movie Psychomania (1971) which featured some great motorcycle stunts. I hadn’t seen a lot of the Hong Kong/kung fu stuff and got a real kick (literally) out of The Legend of the Seven Golden Vampires (1974) and Mr. Vampire (1985). Ed and His Dead Mother (1994) was a nice surprise. It wasn’t well regarded on its release and I had avoided it for years but it holds up as a fun little satire with an engaging performance by Steve Buscemi. There were a few others, but these movies were completely off of my radar before I located them. Andy B: What are your personal criteria for what makes a great zombie film? Glenn Kay: I’m not sure there are any definite rules, but for me it has to have something that will keep me coming back for repeat viewings. Something a little more than just zombies tearing people apart for the sake of blood and guts. The Romero films all have subtext or satire, some movies find ways of making little references of details in the background, some of the funnier films play like classic comedy routines that you want to hear again every so often (or play for your friends). Some are unique and offer something that you’ve never been shown before and need to see again to confirm that it actually happened. Quality helps too. Filmmakers who know the craft and how to elicit an emotional response from guys like me by editing their shots together in just the right way. Just a little extra oomph, I suppose. Andy B: You talk to a lot of zombie heavy hitters in Zombie Movies – The Ultimate Guide, including the one and only Tom Savini. Was there anyone you hoped to talk to but didn’t get the chance? Glenn Kay: I contacted director Peter Jackson’s office. They were incredibly kind, helpful and considered my request, but Mr. Jackson had just finished his King Kong remake, was exhausted and didn’t want to do any more press at that particular time. His office sent me articles and info on the film Dead/Alive aka Braindead that I used in my research. They were all very friendly and pleasant. George A. Romero is extremely nice and amiable in person, but getting my request through all of his managers and agents proved too difficult to secure an interview for this book in time. 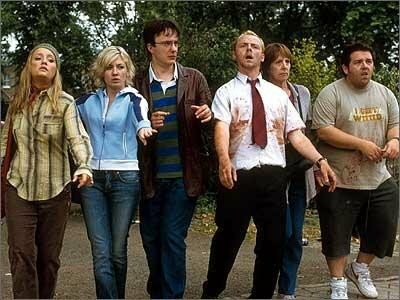 Andy B: You rate “Shaun Of The Dead”, my favourite zombie film, Number 3 on your list of the 25 Greatest Zombie Films Ever Made. Why do you think that particular film resonates so strongly with people? Glenn Kay: It’s well written. There are knowing nods to the classics, like Dawn of the Dead. Subtext is present, as the central character and those around him seem to be stuck in dead end jobs, and so they at times feel and occasionally appear to be zombies (even when they aren’t). The characters are unusually witty and charming. That’s a real plus. It’s funny and it feels real – it acknowledges the absurdity of the situation. And it’s scary when it wants to be, particularly during the climax. The director, Edgar Wright, seems to know exactly what he’s doing. He went through a lengthy preproduction process to test jokes and ideas out, and the final product is carefully constructed. Any filmmaker who can make you laugh and then disturb you moments later, switching back and forth with ease, is clearly a master at the craft of filmmaking and has the audience completely under his control. Andy B: On the flipside, you hold George Romero’s “Land Of The Dead” in high regard, a film that didn’t light up the box office or go over too well with critics (I prefer “Diary Of The Dead” myself, but I might be in the minority). Why do you think people skipped by “Land Of The Dead” in theatres, and why do you think it will hold up over time? Glenn Kay: Universal Pictures (the distributor) liked the film a lot and bumped its release up from October the middle of summer. They thought it would help, but it was a huge mistake. It was released in the same period as Batman Begins and War of the Worlds. A 15 million dollar horror flick never stood a chance against two 150 million dollar blockbusters. 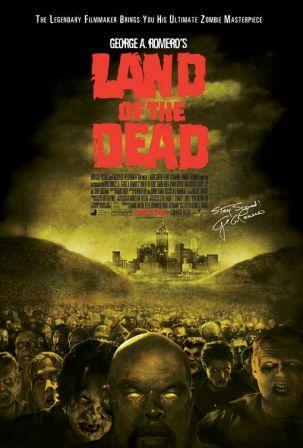 Land of the Dead would have been a more commercially successful film had it been released in October. Even though it trickled out at the box-office at just under 21 million, it did turn a slight profit and has enjoyed great success on home video. The reviews were actually quite positive. The website Rotten Tomatoes certified it Fresh, with 75% of critics responding positively, abnormally high marks for a horror release (and a higher positive percentage than its competitor, War of the Worlds). I like all of Romero’s zombie movies to varying degrees and how the films tend to take a snapshot of issues important to us at particular points in time. While I don’t think it will ever be regarded as well as Dawn, Night or even Day, I do believe that there is a lot of interesting subtext in Land about what’s been going on in America post 9/11 (that will be of interest in the future), good performances (particularly Robert Joy) and a lot of ideas (even if some are cut a little short). I’m in it briefly too, so of course there’s a bit of a personal bias. You’re not alone about Diary though. I enjoyed it and I have a friend who also prefers it to Land of the Dead. And, when Romero’s next movie comes out in a year or so, I suppose we’ll have another Romero flick to discuss, compare and rate. Andy B: You had the chance to play one of the undead in “Land Of The Dead”, on set with Romero. Any particular highlights of being a zombie you’d care to share? Glenn Kay: It was freezing… really, really freezing. Walking out of that unheated wave pool was the coldest I’ve ever been in my life and I’ll always remember it. For extras, film sets in general aren’t that interesting. You sit around for hours while the crew sets up, and then they call you out for a few minutes to walk by in the far background, before sending you away. You’re not allowed to speak to the actors or crew unless spoken to. There were 100 or more zombie extras on the Land of the Dead set. Getting a great make-up job was exciting. Just finding a way to get myself close to the camera and knowing that I would be seen (if the shot was even used) was a thrill. But the most amazing moment came when the director, George A. Romero, walked over and started a casual conversation with me. Finding out that one of your filmmaking heroes is a really nice guy in person is pretty fantastic. Andy B: Finally, what film would you recommend for the novice zombie filmgoer and why? Glenn Kay: If they pick up my book, I’d advise they go through the reviews, see what they’re interested in, and work backwards from the most “Highly Recommended”. If you like what you see, then see the “Recommended” titles, then the “At Your Own Risk” selections. I think that the “Avoid at all Costs” titles are only for the most hardened and obsessive zombie fans. You can’t go wrong with any of these titles: Dawn of the Dead (1978), Night of the Living Dead (1968 and its effective remake in 1990), Shaun of the Dead (2004), Day of the Dead (2005), The Return of the Living Dead (1985), 28 Days Later (2002) and 28 Weeks Later (2007), Re-Animator (1985), Dead Alive (1992) or The Serpent and the Rainbow (1988). 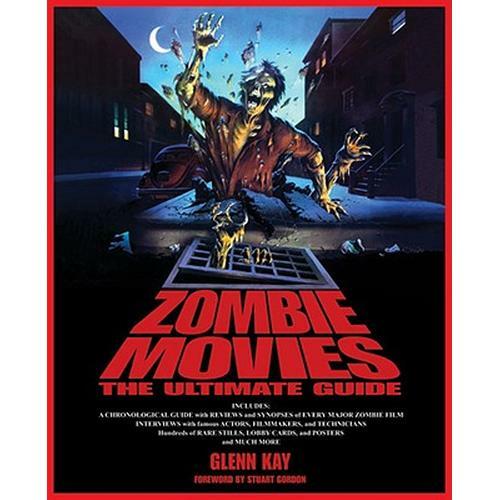 Glenn Kay’s Zombie Movies – The Ultimate Guide (ISBN 978-1-55652-770-8) is published by Chicago Review Press and in stores now. Check out Andy B’s interview with Jonathan Maberry, the author of Zombie CSU – The Forensics of The Living Dead this Thursday at Biff Bam Pop!